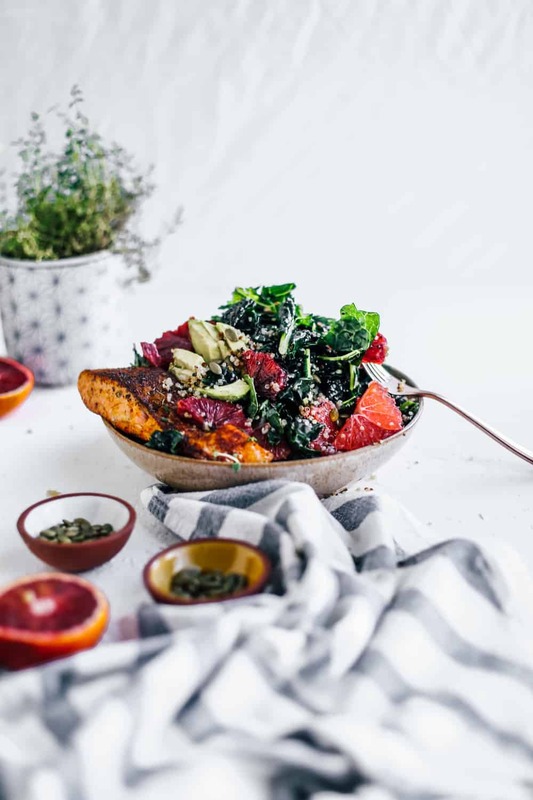 Your favorite restaurant style kale salad, at home! 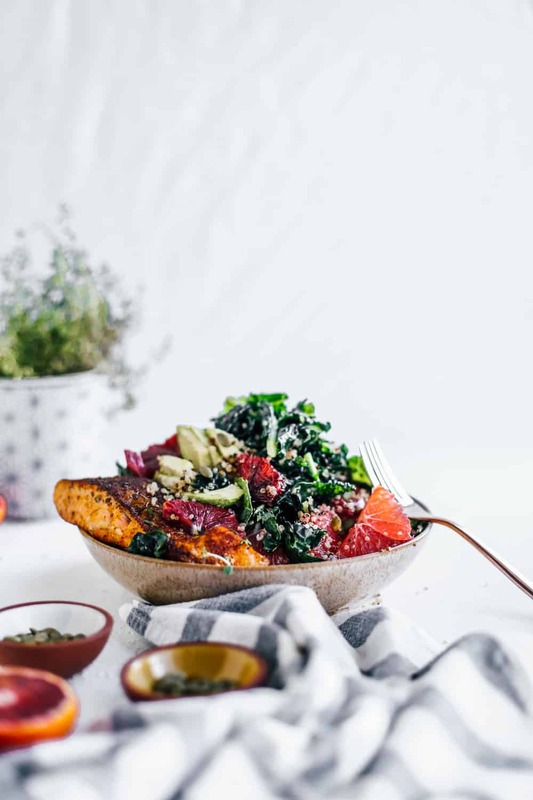 This is my go to kale salad for that light, healthy meal that still leaves you feeling flavor satisfied and actually full. It almost has a ‘spa’ like quality to it. Filled with all the healthy things that your body needs but still tastes insane! I promise you that the kale in this salad doesn’t taste like your food’s garnish! If kale is massaged properly it has an amazing texture that holds up well and will never turn soggy on you! I love filling this salad up with fresh winter citrus. 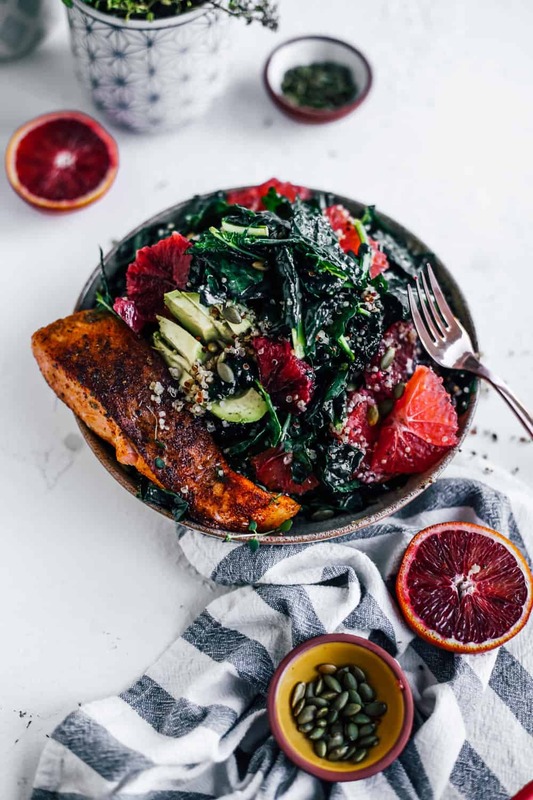 I think citrus in salads is often overlooked but these segments are little hidden gems bursting with bright flavor! They give your salad a wow factor. My favorite addition is the quinoa. I know salads probably aren’t your go to meal for these cold winter months but believe me when I tell you it’s so hearty! The quinoa fills it out and gives the whole salad this ‘meal’ like quality. If quinoa isn’t your thing you could totally swap it out for rice or any grains. To make it a complete meal I always add a salmon filet on top! If chicken is more your speed by all means swap it out. Blackened seasoning is so versatile and goes well with any protein. I always have a pre made bowl of seasoning in my spice drawer that is ready to go. I love blackening any protein in my Le Creuset cast iron skillet. The skillet retains so much heat and gets an amazing caramelized crust. I seriously don’t cook meat in anything else! If you’re looking for a delicious lighter meal to restart your week, this is it! In a small bowl or Mason jar combine all honey mustard vinaigrette ingredients. Whisk or shake in shaker jar for 30-45 seconds or until well blended. Place into the refrigerator and chill while making the rest of the salad. In a large salad bowl add 1 Tablespoon of olive oil. Remove center stem and chop kale leaves. 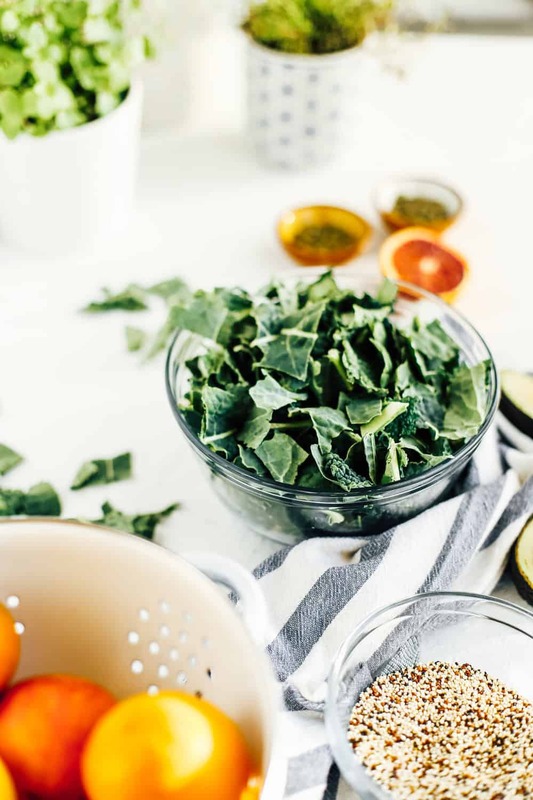 Place into large bowl and massage kale pieces with olive oil. This will help break down the kale and leave you with tender pieces instead of hard, crunchy ones. Add in quinoa, blood orange and grapefruit slices, pumpkin seeds, and toss. Place salad into the refrigerator until serving. In a small bowl, whisk together all blackened seasoning ingredients. Rub mixture evenly onto both sides of salmon filets. 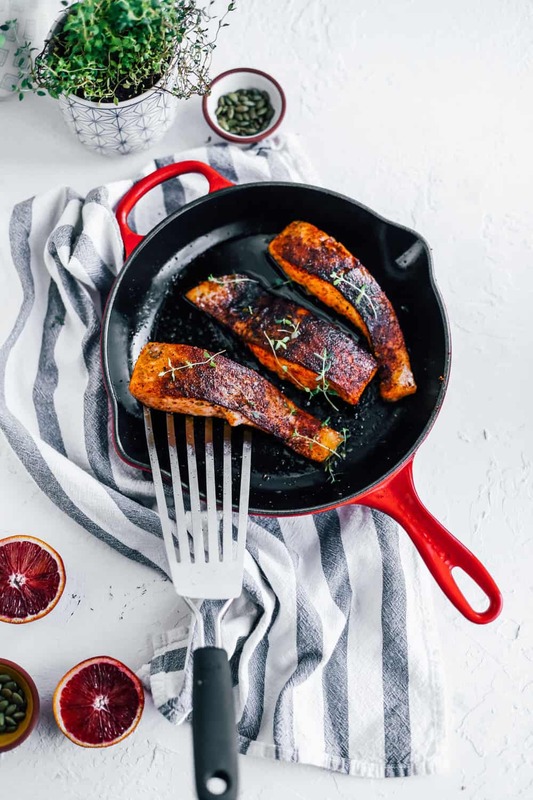 In a heavy bottom cast iron skillet add in 1 ½ tablespoons of olive oil and turn on to medium-high heat. Place a drop of water onto skillet; if it ‘dances’ the skillet is hot enough. Place your fish into skillet skin side down and cook for 3-4 minutes. With a fish turner flip fish and cook for an additional 1-2 minutes. 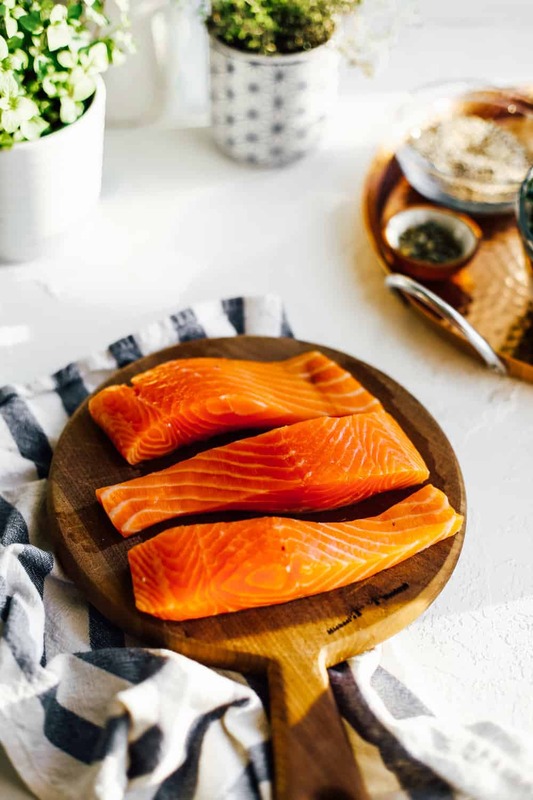 Place fish onto a paper towel lined plate and serve with salad. This salad will make (2) dinner portions and (3-4) side portions. Do you happen to know the total calories for this recipe? BWT – I made it this evening and it was WONDERFUL! Thank you so much for the recipe. So happy to hear that you loved the salad! I’m sorry I don’t have the exact calorie information but I know it’s an extraordinarily healthy salad!